We wanted to show you guys our new car. When we moved here, we were given two cars pretty much right away. A jeep wrangler (you can see it in the background) and a volvo wagon. Our jeep has been running like a champ, and the volvo is strong too, except for some rust along the bottom, which has kept it from passing inspection. 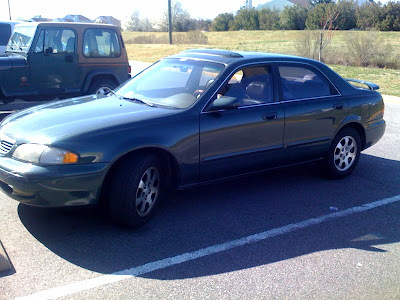 Last week, we got a call from our church that they had received a car as a donation and wanted to pass it along to us. Sweet. We are super grateful for everyone's generosity, and thankful to God for taking care of us. Life is good, and we just wanted to share the latest way that God has really taken care of us.